We are thrilled to announce that ClearScore has been named Innovative Financial Product of the Year at The Techies awards, hosted by Tech World. The Techies celebrates startups, digital disruptors, innovation and emerging technology, and we were proud to be among a host of inspiring and trailblazing businesses. On Thursday night Justin, Anna, Frank and Klaus headed out from our new offices on Lambeth Road to the ME Hotel for the ceremony. The night saw 20 awards presented, ranging from Innovative Product to Rock Star Developer (a category some of our team definitely think they’re qualified for!) We were particularly pleased to be recognised as most Innovative Financial Product, as constant innovation is at the heart of our business. 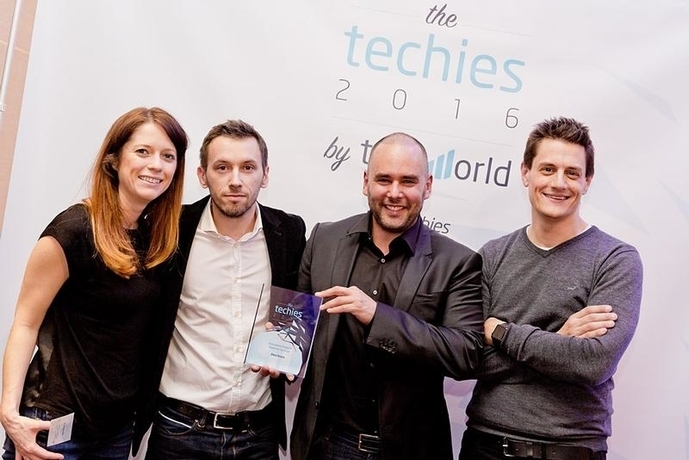 Other prestigious winners to be recognised in the Techies include Ticketmaster, which won several awards including the Grand Prix award, and Barclays, which was praised for its Rise accelerator. Natural Resources Wales was recognised for its innovative joined-up approach to teamwork. Anna and Frank applaud in anticipation of an excellent acceptance speech by Klaus! This award concludes a fantastic February for the whole team- we have supported National Student Money Week, hired three new team members and were named one of the top fintech companies to watch by the Independent newspaper. Since launching back in June 2015, we have helped thousands of people unlock their data and get to grips with their finances. We have launched the UK’s first ever credit checking mobile app, which went straight to the top of the iTunes charts, and we have even bigger plans for the rest of 2016. We’re now looking forward to placing the beautiful Techies trophy next to the Moneynet and Growing Business awards we’ve won since we launched – we even have an awards cabinet (bookshelf) to put them in now!